This successful program just got a grant to expand across L.A. The pound as we know it was designed to contain or dispose of strays. These days, most of us think the goal is to save and eventually find new homes for them. But especially if a shelter is to be deemed “no kill,” holding a dog can entail locking an intensely social creature alone in a cage, perhaps indefinitely. Jail time can make any dog mean, fearful, compulsive, and depressed—in a word, nuts. Which makes it less adoptable. Which means it’s trapped. 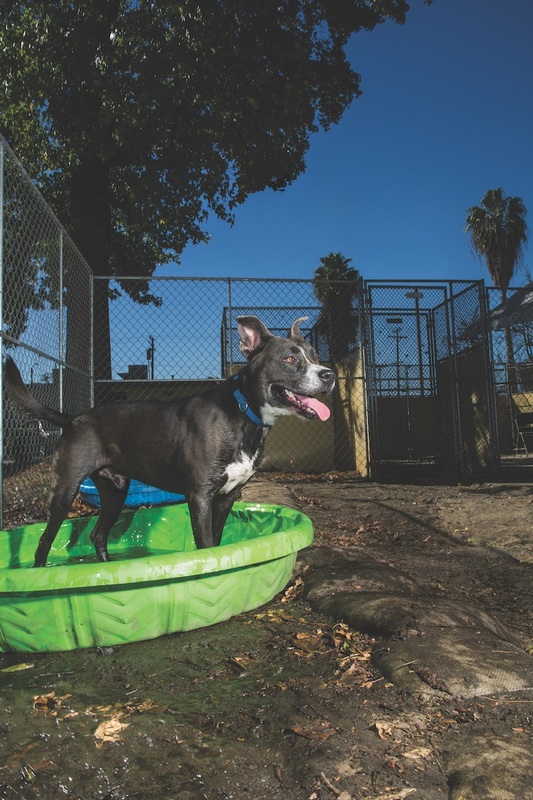 That’s where a program called Dogs Playing for Life comes in and why, on some mornings, a fenced yard at the L.A. County Animal Care Center in Downey resembles a dog park. Two scruffy mutts circle each other, sniff butts, and exchange kisses. Two more race madly. An old male tries to hump every female in sight, but his legs keep giving out. 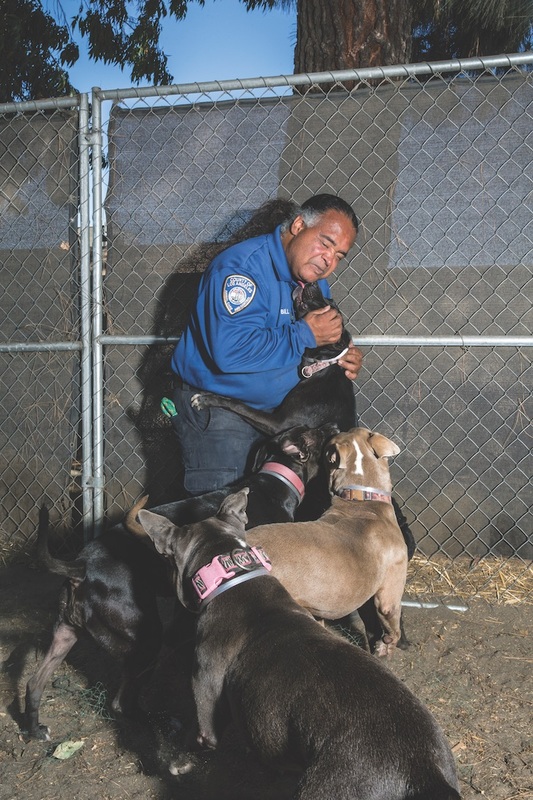 The shelter, which serves two dozen, mostly poor, communities, is so physically grim—pale yellow barracks, the pervasive scent of pee—that the sight of joyful canines almost doesn’t compute. Sadler, who’s 50, was working outside of New York City in the late 1990s when the idea came into focus. A wealthy client paid her to train some dogs at a local shelter. There were many and time was short, so Sadler decided to let them play together first in a loosely supervised group. The roughhousing seemed to transform the dogs: They were relaxed. Happy. Training them was easier than she expected. Sadler took note. So did her client, who for the next 17 years paid her to work with any shelter that was interested. Persuading shelters to let her experiment could be a challenge. Vets worried about dogs fighting, and staff resisted change. Sadler’s own attitude probably didn’t help. “I can be pretty abrasive,” she says and laughs. But then they saw how dogs that participated in the program bounced around to contented exhaustion and didn’t fight. They became more social and less hyper, barky, and loud. Dogs that had seemed shy turned out to have been cowed by the kennel din. Others that attacked the bars were desperate to move. Their true personalities emerged. Employees liked watching the animals play, and that outside time meant outside pooping, keeping sleeping areas clean. 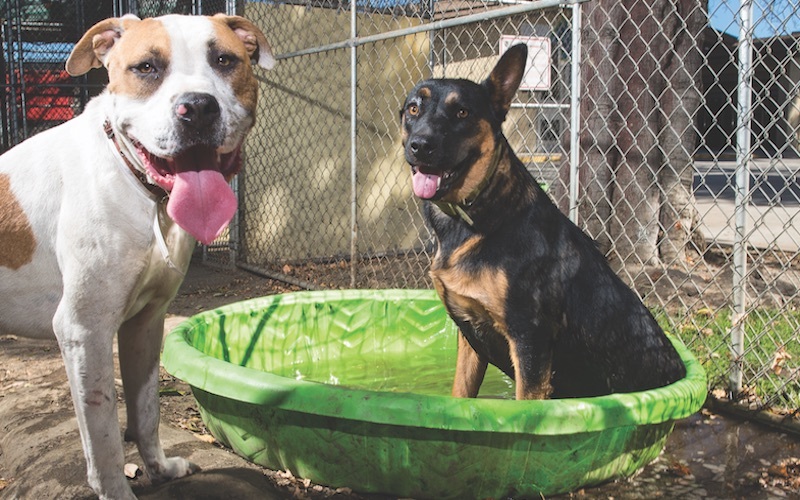 Would-be adopters liked that they could see how dogs behaved in a more natural setting. And for shelter administrators, the optics were great. Word spread. Over years spent largely on the road—by the end of 2017 she will have worked for some 200 shelters in multiple states—Sadler distilled her methods into a concise program aimed at “open admission” shelters (facilities that don’t turn away any dogs, regardless of their age, health, or behavior) and paid for by grants. It includes classroom training for staff (which, Sadler says, involves “lots of videos that make everyone’s heads explode as we pry open entrenched attitudes”), a manual with equipment lists (flat collars, leashes, an air horn to halt conflicts that could involve the use of teeth), and rules for grouping canines in the yard: Dogs whose play style is “gentle & dainty,” for instance, should not share space with the “rough & rowdy.” In August, the ASPCA and Petco Foundation gave Dogs Playing for Life a $1.5 million grant to expand to municipal shelters across the country, beginning in L.A. The morning passes; dogs cycle in and out. Three jump into a filled kiddie pool and lap up dirty water. A pit bull rolls over for a belly rub. A skinny shepherd scrounges up a rock and begs for a game of fetch. All are animals whose lives have somehow gone wrong, leaving them homeless and facing uncertain futures. For a few minutes, though, in the yard, they are the pets they once were and might again be.